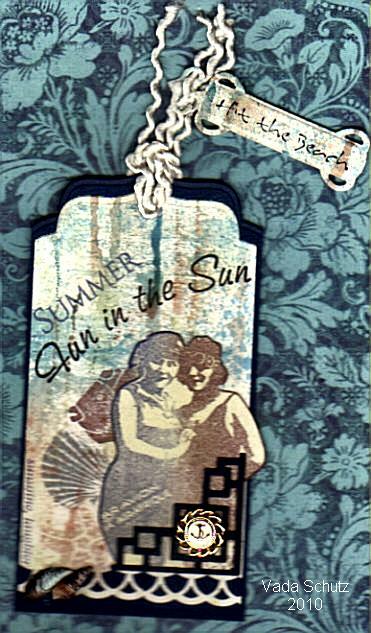 Vada's Blog Stamp Inks and Paper : Tag Tuesday Challenge 58# is “Summer”. For my Tag, I went with something “COOL”, as it hot here today. Ladies, are from Alluring Impressions. Fish, Shell and Starfish are from Cornish Heritage Farms. Fun in the Sun is from Inkadinkado. Summer is from Hero Arts. Background is Watercolor Roll, and Hit the Beach is from TAC. Great tag Vada, I went with the cool colors too! Love your tag Vada!! I love those images and hopefully I will get to do a similar type, with a photo of my mom!!! Love your vintage beauties! Great tag Vada! 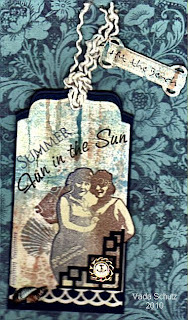 This is gorgeous - such a great take on the summertime theme. Love your background and the vintage feel of it all! Love the colors, beautiful tag! Nice vintage touch with the soft blues and the vintage images.